You are here: Home > Is homebirth like amniocentesis? Henci Goer has finally moved the homebirth debate where it ought to be (Is Home Birth a Reasonable Option). It’s not about whether homebirth is as safe as hospital birth; even she acknowledges that hospital birth is safer. The issue is whether homebirth is safe enough. That, as Goer recognizes is a value judgment. It is up to the individual woman to decided if it is worth it to her to expose her baby to an increased risk of death simply to have the birth “experience” that she desires. In an effort to make the deliberate decision to risk a baby’s life more palatable, Goer attempts to equate homebirth with amniocentesis, and with that, her argument goes off the rails. … To put this into perspective, the excess risk of losing the pregnancy as a result of having an amniocentesis is 60 per 10,000. No one is advising women against amniocentesis on grounds of its danger, so we may conclude that an excess risk considerably more than 8 per 10,000 is deemed tolerable by the obstetric community. At a superficial level, Goer is correct in her comparison. Both amniocentesis and homebirth involve exposing a baby to an increased risk of death in exchange for a benefit that accrues to the mother. In the case of amnio, the benefit is knowledge of genetic defects and the opportunity to abort a genetically abnormal fetus. In the case of homebirth, the benefit is the mother’s experience. But the similarities end at that superficial level. The gestational age of the baby: Amniocentesis is done in the mid second trimester, before viability. Homebirth occurs long after viability has been reached. The decision to continue the pregnancy: Amnio is usually chosen to decide whether to continue a pregnancy. Homebirth is chosen for a pregnancy that the mother has already decided to continue. The relative risks: In both cases, the absolute risks are small. However, while amnio increases the rate of pregnancy loss by 6%, homebirth increases the risk of perinatal death by 200% or more. Moreover, Goer’s claim about physician counseling is flat out false. Goer insists that “no one is advising women against amniocentesis on grounds of its danger.” Actually every doctor is ethically and legally required to counsel women about the risks of amniocentesis. Such counseling typically includes the recommendation against amniocentesis if the woman is not going to act on the information (would not abort the pregnancy). Amniocentesis, like all medical procedures, has risks and benefits. The primary benefit is the ability to terminate a pregnancy. If that option is not on the table, doctors routinely counsel women that the risks outweigh the benefits. The excess risk is not determined to be “tolerable” by the obstetric community. It is determined to be of the same magnitude as the risk of having a baby with a serious chromosomal abnormality. Amnio is only offered when the risk of pregnancy loss from amniocentesis is exceeded by the risk of a genetic abnormality in the baby. That risk is determined by age and by screening tests such as alpha-fetoprotein. 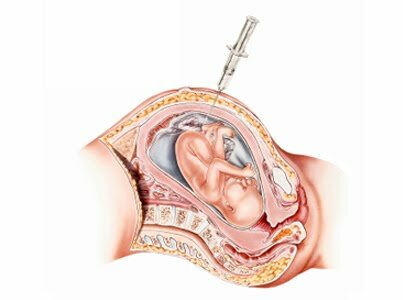 Furthermore, the decision to have an amnio is determined by whether the risk is tolerable to the mother, not to the obstetric community. Even when the risk of a chromosomal abnormality far exceeds the risk of loss from amniocentesis, the mother won’t have an amnio unless she feels that the risk of loss is acceptable to her. I understand what Goer is trying to do here. Having finally acknowledged that homebirth increases the risk of perinatal death, she is trying to put an acceptable face on deliberately choosing that risk. But no one has ever claimed that an amniocentesis is as safe or safer than foregoing an amnio. Moreover, the two choices differ in gestational age, decision about continuing a pregnancy and relative risk. It is one thing to say that amnio is safe enough for women at increased risk of having a baby with a genetic abnormality, when done long before viability, in a pregnancy that will be terminated if the baby has a genetic defect. It is another thing entirely to risk the life of a baby at term, in a wanted pregnancy, for no other reason that the desire for a particular experience.